"Startup" redirects here. For other uses, see Startup (disambiguation). Startups typically begin by a founder (solo-founder) or co-founders who have a way to solve a problem. The founder(s) of a startup will begin market validation by problem interview, solution interview, and building a minimum viable product (MVP), i.e. a prototype, to develop and validate their business models. The startup process can take a long period of time (by some estimates, three years or longer), and hence sustaining effort is required. Sustaining effort over the long term is especially challenging because of the high failure rates and uncertain outcomes. Models behind startups presenting as ventures are usually associated with design science. Design science uses design principles considered to be a coherent set of normative ideas and propositions to design and construct the company backbone. For example, one of the initial design principles in effectuation is "affordable loss". It’s better to first make a must-have for a small number of users (early adopters) than a nice-to-have for a large number of users. It is much easier to get more users than to go from nice-to-have to must-have. Because of the lack of information, high uncertainty, the need to make decisions quickly, founders of startups use lots of heuristics and exhibit biases in their startup actions. Biases and heuristics are parts of our cognitive toolboxes in the decision making process, and they help us to take a decision as quick as possible under uncertainty, but sometimes become erroneous and fallacious. Entrepreneurs often become not only overconfident about their startups but also about their personal influence on an outcome (case of illusion of control). Entrepreneurs tend to believe they have more degree of control over events, discounting the role of luck. Below are some of the most important decision biases of entrepreneurs in start up a new business. Overconfidence: Perceive a subjective certainty higher than the objective accuracy. Illusion of control: Overemphasize how much skills, instead of chance, improve performance. The law of small numbers: Reach conclusions about a larger population using a limited sample. Availability bias: Make judgments about the probability of events based on how easy it is to think of examples. Escalation of commitment: Persist unduly with unsuccessful initiatives or courses of action. Startups use a number of action principles (lean startup) to generate evidence as quickly as possible to reduce the downside effect of decision biases such as escalation of commitment, overconfidence, and illusion of control. Many entrepreneurs seek feedback from mentors in creating their startups. Mentors guide founders and impart entrepreneurial skills and may increase self-efficacy of the nascent entrepreneurs. There are many principles in creating a startup. A key principle of startup is to validate the market need before building a customer-centric product to avoid business ideas with weak demand. Market validation can be done in a number of ways, including surveys, cold calling, email responses, word of mouth or through sample research. Design thinking is used to understand the customers' need in an engaged manner. Design thinking and customer development can be biased, because they do not remove the risk of bias because the same biases will manifest themselves in the sources of information, the type of information sought, and the interpretation of that information. Encouraging people to “consider the opposite” of whatever decision they are about to make tends to reduce biases such as overconfidence, the hindsight bias, and anchoring (Larrick, 2004; Mussweiler, Strack, & Pfeiffer, 2000). In startups, many decisions are made under uncertainty, and hence a key principle for startups is to be agile and flexible. Founders can embed options to design startups in flexible manners, so that the startups can change easily in future. Uncertainty can vary within-person (I feel more uncertain this year than last year) and between-person (he feels more uncertain than she does). A study found that when entrepreneurs feel more uncertain, they identify more opportunities (within-person difference), but entrepreneurs who perceive more uncertainties than others do not identify more opportunities than others do (no between-person difference). Startups may form partnerships with other firms to enable their business model to operate. To become attractive to other businesses, startups need to align their internal features, such as management style and products with the market situation. In their 2013 study, Kask and Linton develop two ideal profiles, or also known as configurations or archetypes, for startups that are commercializing inventions. The inheritor profile calls for a management style that is not too entrepreneurial (more conservative) and the startup should have an incremental invention (building on a previous standard). This profile is set out to be more successful (in finding a business partner) in a market that has a dominant design (a clear standard is applied in this market). In contrast to this profile is the originator which has a management style that is highly entrepreneurial and in which a radical invention or a disruptive innovation (totally new standard) is being developed. This profile is set out to be more successful (in finding a business partner) in a market that does not have a dominant design (established standard). New startups should align themselves to one of the profiles when commercializing an invention to be able to find and be attractive to a business partner. By finding a business partner, a startup has greater chances of becoming successful. Startups need to learn at a huge speed before running out of resources. Proactive actions (experimentation, searching, etc.) enhance a founder's learning to start a company. To learn effectively, founders often formulate falsifiable hypotheses, build a minimum viable product (MVP), and conduct A/B testing. Founders or (Co)founders are people involved in the initial launch of startup companies. Anyone can be a co-founder, and an existing company can also be a co-founder, but the most common co-founders are founder-CEOs, engineers, hackers, web developers, web designers and others involved in the ground level of a new, often venture. The founder that is responsible for the overall strategy of the startup plays the role of founder-CEOs, much like CEOs in established firms. The language of securities regulation in the United States considers co-founders to be "promoters" under Regulation D. The U.S. Securities and Exchange Commission definition of "Promoter" includes: (i) Any person who, acting alone or in conjunction with one or more other persons, directly or indirectly takes initiative in founding and organizing the business or enterprise of an issuer; However, not every promoter is a co-founder. In fact, there is no formal, legal definition of what makes somebody a co-founder. The right to call oneself a co-founder can be established through an agreement with one's fellow co-founders or with permission of the board of directors, investors, or shareholders of a startup company. When there is no definitive agreement (like SHA), disputes about who the co-founders are can arise. Self-efficacy refers to the confidence an individual has to create a new business or startup. It has a strong relation with startup actions. Entrepreneurs' sense of self-efficacy can play a major role in how they approach goals, tasks, and challenges. Entrepreneurs with high self-efficacy—that is, those who believe they can perform well—are more likely to view difficult tasks as something to be mastered rather than something to be avoided. Entrepreneurs often feel stressed. They have internal and external pressures. Internally, they need to meet deadlines to develop the prototypes and get the product or service ready for market. Externally they are expected to meet milestones of investors and other stakeholders to ensure continued resources from them on the startups. Coping with stress is critical to entrepreneurs because of the stressful nature of start up a new firm under uncertainty. Coping stress unsuccessfully, entrepreneurs could be victims of stressors and lead to emotional exhaustion, and the founders may close or exit the startups. Sustaining effort is required as the startup process can take a long period of time, by one estimate, three years or longer (Carter et al., 1996; Reynolds & Miller, 1992). Sustaining effort over the long term is especially challenging because of the high failure rates and uncertain outcomes. Some startup founders have a more casual or offbeat attitude in their dress, office space and marketing, as compared to executives in established corporations. For example, startup founders in the 2010s may wear hoodies, sneakers and other casual clothes to business meetings. Their offices may have recreational facilities in them, such as pool tables, ping pong tables, foosball tables and pinball machines, which are used to create a fun work environment, stimulate team development and team spirit, and encourage creativity. Some of the casual approaches, such as the use of "flat" organizational structures, in which regular employees can talk with the founders and chief executive officers informally, are done to promote efficiency in the workplace, which is needed to get their business off the ground. In a 1960 study, Douglas McGregor stressed that punishments and rewards for uniformity in the workplace are not necessary because some people are born with the motivation to work without incentives. Some startups do not use a strict command and control hierarchical structure, with executives, managers, supervisors and employees. Some startups offer employees incentives such as stock options, to increase their "buy in" from the start up (as these employees stand to gain if the company does well). This removal of stressors allows the workers and researchers in the startup to focus less on the work environment around them, and more on achieving the task at hand, giving them the potential to achieve something great for both themselves and their company. The failure rate of startup companies is very high. A 2014 article in Fortune estimated that 90% of startups ultimately fail. In a sample of 101 unsuccessful start ups, the top five factors in failure were lack of consumer interest in the product or service (42% of failures); funding or cash problems (29%); personnel or staffing problems (23%); competition from rival companies (19%); and problems with pricing of the product or service (18%). In cases of funding problems it can leave employees without paychecks. Sometimes these companies are purchased by other companies, if they are deemed to be viable, but oftentimes they leave employees with very little recourse to recoup lost income for worked time. Failed entrepreneurs, or restarters, who after some time restart in the same sector with more or less the same activities, have an increased chance of becoming a better entrepreneur. However, some studies indicate that restarters are more heavily discouraged in Europe than in the US. Many institutions and universities provide training on startups. In the context of universities, some of the courses are entrepreneurship courses that also deal with the topic of startups, while other courses are specifically dedicated to startups. Startup courses are found both in traditional economic or business disciplines as well as the side of information technology disciplines. As startups are often focused on software, they are also occasionally taught while focusing on software development alongside the business aspects of a startup. Founders go through a lot to set up a startup. A startup requires patience and resilience, and training programs need to have both the business components and the psychological components. Entrepreneurship education is effective in increasing the entrepreneurial attitudes and perceived behavioral control, helping people and their businesses grow. Most of startup training falls into the mode of experiential learning (Cooper et al., 2004; Pittaway and Cope, 2007), in which students are exposed to a large extent to a real-life entrepreneurship context as new venture teams (Wu et al., 2009). An example of group-based experiential startup training is the Lean LaunchPad initiative that applies the principles of customer development (Blank and Dorf, 2012) and Lean Startup (Ries, 2011) to technology-based startup projects. As startups are typically thought to operate under a notable lack of resources, have little or no operating history, and to consist of individuals with little practical experience, it is possible to simulate startups in a classroom setting with reasonable accuracy. In fact, it is not uncommon for students to actually participate in real startups during and after their studies. Similarly, university courses teaching software startup themes often have students found mock-up startups during the courses and encourage them to make them into real startups should they wish to do so. Such mock-up startups, however, may not be enough to accurately simulate real-world startup practice if the challenges typically faced by startups (e.g. lack of funding to keep operating) are not present in the course setting. To date, much of the entrepreneurship training is yet personalized to match the participants and the training. The size and maturity of the startup ecosystem is where a startup is launched and where it grows to have an effect on the volume and success of the startups. The startup ecosystem consists of the individuals (entrepreneurs, venture capitalists, angel investors, mentors, advisors); institutions and organizations (top research universities and institutes, business schools and entrepreneurship programs and centres operated by universities and colleges, non-profit entrepreneurship support organizations, government entrepreneurship programs and services, Chambers of commerce) business incubators and business accelerators and top-performing entrepreneurial firms and startups. A region with all of these elements is considered to be a "strong" startup ecosystem. One of the most famous startup ecosystems is Silicon Valley in California, where major computer and internet firms and top universities such as Stanford University create a stimulating startup environment, Boston (where Massachusetts Institute of Technology is located) and Berlin, home of WISTA (a top research area), numerous creative industries, leading entrepreneurs and startup firms. Startup advocates are also trying to build a community of tech startups in New York City with organizations like NY Tech Meet Up and Built in NYC. In the early 2000s, the patent assets of failed startup companies are being purchased by what are derogatorily known as patent trolls, who then take the patents from the companies and assert those patents against companies that might be infringing the technology covered by the patent. Diagram of the typical financing cycle for a startup company. Startup investing is the action of making an investment in an early-stage company (the startup company). Beyond founders' own contributions, some startups raise additional investment at some or several stages of their growth. Not all startups trying to raise investments are successful in their fundraising. In the United States, the solicitation of funds became easier for startups as result of the JOBS Act. Prior to the advent of equity crowdfunding, a form of online investing that has been legalized in several nations, startups did not advertise themselves to the general public as investment opportunities until and unless they first obtained approval from regulators for an initial public offering (IPO) that typically involved a listing of the startup's securities on a stock exchange. Today, there are many alternative forms of IPO commonly employed by startups and startup promoters that do not include an exchange listing, so they may avoid certain regulatory compliance obligations, including mandatory periodic disclosures of financial information and factual discussion of business conditions by management that investors and potential investors routinely receive from registered public companies. 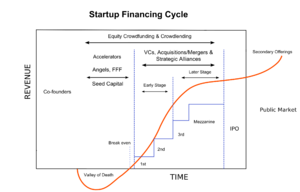 Investors are generally most attracted to those new companies distinguished by their strong co-founding team, a balanced "risk/reward" profile (in which high risk due to the untested, disruptive innovations is balanced out by high potential returns) and "scalability" (the likelihood that a startup can expand its operations by serving more markets or more customers). Attractive startups generally have lower "bootstrapping" (self-funding of startups by the founders) costs, higher risk, and higher potential return on investment. Successful startups are typically more scalable than an established business, in the sense that the startup has the potential to grow rapidly with a limited investment of capital, labor or land. Timing has often been the single most important factor for biggest startup successes, while at the same time it's identified to be one of the hardest things to master by many serial entrepreneurs and investors. Startups have several options for funding. Revenue-based financing lenders can help startup companies by providing non-dilutive growth capital in exchange for a percentage of monthly revenue. Venture capital firms and angel investors may help startup companies begin operations, exchanging seed money for an equity stake in the firm. Venture capitalists and angel investors provide financing to a range of startups (a portfolio), with the expectation that a very small number of the startups will become viable and make money. In practice though, many startups are initially funded by the founders themselves using "bootstrapping", in which loans or monetary gifts from friends and family are combined with savings and credit card debt to finance the venture. Factoring is another option, though it is not unique to startups. Other funding opportunities include various forms of crowdfunding, for example equity crowdfunding, in which the startup seeks funding from a large number of individuals, typically by pitching their idea on the Internet. While some (would-be) entrepreneurs believe that they can’t start a company without funding from VC, Angel, etc. That is not the case. If a company's value is based on its technology, it is often equally important for the business owners to obtain intellectual property protection for their idea. The newsmagazine The Economist estimated that up to 75% of the value of US public companies is now based on their intellectual property (up from 40% in 1980). Often, 100% of a small startup company's value is based on its intellectual property. As such, it is important for technology-oriented startup companies to develop a sound strategy for protecting their intellectual capital as early as possible. Startup companies, particularly those associated with new technology, sometimes produce huge returns to their creators and investors—a recent example of such is Google, whose creators became billionaires through their stock ownership and options. After the Great Depression, which was blamed in part on a rise in speculative investments in unregulated small companies, startup investing was primarily a word of mouth activity reserved for the friends and family of a startup's co-founders, business angels and Venture Capital funds. In the United States this has been the case ever since the implementation of the Securities Act of 1933. Many nations implemented similar legislation to prohibit general solicitation and general advertising of unregistered securities, including shares offered by startup companies. In 2005, a new Accelerator investment model was introduced by Y Combinator that combined fixed terms investment model with fixed period intense bootcamp style training program, to streamline the seed/early stage investment process with training to be more systematic. Following Y Combinator, many accelerators with similar models have emerged around the world. The accelerator model have since become very common and widely spread and they are key organizations of any Startup ecosystem. Title II of the Jumpstart Our Business Startups Act (JOBS Act), first implemented on September 23, 2013, granted startups in and startup co-founders or promoters in US. the right to generally solicit and advertise publicly using any method of communication on the condition that only accredited investors are allowed to purchase the securities. However the regulations affecting equity crowdfunding in different countries vary a lot with different levels and models of freedom and restrictions. In many countries there are no limitations restricting general public from investing to startups, while there can still be other types of restrictions in place, like limiting the amount that companies can seek from investors. Due to positive development and growth of crowdfunding, many countries are actively updating their regulation in regards to crowdfunding. The first known investment-based crowdfunding platform for startups was launched in Feb. 2010 by Grow VC, followed by the first US. based company ProFounder launching model for startups to raise investments directly on the site, but ProFounder later decided to shut down its business due regulatory reasons preventing them from continuing, having launched their model for US. markets prior to JOBS Act. With the positive progress of the JOBS Act for crowd investing in US., equity crowdfunding platforms like SeedInvest and CircleUp started to emerge in 2011 and platforms such as investiere, Companisto and Seedrs in Europe and OurCrowd in Israel. The idea of these platforms is to streamline the process and resolve the two main points that were taking place in the market. The first problem was for startups to be able to access capital and to decrease the amount of time that it takes to close a round of financing. The second problem was intended to increase the amount of deal flow for the investor and to also centralize the process. Internal startups are a form of corporate entrepreneurship. Large or well-established companies often try to promote innovation by setting up "internal startups", new business divisions that operate at arm's length from the rest of the company. Examples include Bell Labs, a research unit within Bell Corporation and Target Corporation (which began as an internal startup of the Dayton's department store chain) and threedegrees, a product developed by an internal startup of Microsoft. To accommodate startups internally, companies, such as Google has made strides to make purchased startups and their workers feel at home in their offices, even letting them bring their dogs to work. Some startups become big and they become unicorns, i.e. privately held startup companies valued at over $1 billion. The term was coined in 2013 by venture capitalist Aileen Lee, choosing the mythical animal to represent the statistical rarity of such successful ventures. According to TechCrunch, there were 279 unicorns as of March 2018, and most of the unicorns are in China, followed by the USA. The unicorns are concentrated in a few countries: China (131), US (76), India (14), UK (7), Indonesia (4), Argentina (4), Singapore (3), Switzerland (2), South Korea (2), Hong Kong (2), and 13 countries (1 each). The largest unicorns included Ant Financial, ByteDance, DiDi, Uber, Xiaomi, and Airbnb. ^ Robehmed, Natalie (16 December 2013). "What Is A Startup?". Forbes. Retrieved 30 April 2016. ^ Riitta Katila, Eric L. Chen, and Henning Piezunka (7 June 2012). "All the right moves: How entrepreneurial firms compete effectively" (PDF). Strategic Entrepreneurship Jnl. 6 (2): 116–132. doi:10.1002/sej.1130. Retrieved 18 May 2017. ^ a b c Schmitt, A. (2018). "A Dynamic Model of Entrepreneurial Uncertainty and Business Opportunity Identification: Exploration as a Mediator and Entrepreneurial Self-Efficacy as a Moderator". Entrepreneurship Theory and Practice. 42 (6): 835–859. doi:10.1177/1042258717721482. ^ Uy, Marilyn A.; Foo, Maw-Der; Ilies, Remus (2015-05-01). "Perceived progress variability and entrepreneurial effort intensity: The moderating role of venture goal commitment". Journal of Business Venturing. 30 (3): 375–389. doi:10.1016/j.jbusvent.2014.02.001. ISSN 0883-9026. ^ van Burg, Elco; Romme, A. Georges L.; Gilsing, Victor A.; Reymen, Isabelle M. M. J. (March 2008). "Creating University Spin-Offs: A Science-Based Design Perspective". Journal of Product Innovation Management. 25 (2): 114–128. doi:10.1111/j.1540-5885.2008.00291.x. hdl:1871/23732. ISSN 0737-6782. ^ Sarasvathy, Saras D.; Dew, Nicholas; Read, Stuart; Wiltbank, Robert (2008-03-01). "Designing Organizations that Design Environments: Lessons from Entrepreneurial Expertise". Organization Studies. 29 (3): 331–350. doi:10.1177/0170840607088017. hdl:10945/41241. ISSN 0170-8406. ^ a b Zhang, Stephen X.; Cueto, Javier (2015-11-09). "The Study of Bias in Entrepreneurship". Entrepreneurship Theory and Practice. 41 (3): 419–454. doi:10.1111/etap.12212. ISSN 1042-2587. ^ Ho, Moon-Ho Ringo; Uy, Marilyn A.; Kang, Bianca N. Y.; Chan, Kim-Yin (2018). "Impact of Entrepreneurship Training on Entrepreneurial Efficacy and Alertness among Adolescent Youth". Frontiers in Education. 3. doi:10.3389/feduc.2018.00013. ISSN 2504-284X. ^ a b Harms, Rainer (2015-11-01). "Self-regulated learning, team learning and project performance in entrepreneurship education: Learning in a lean startup environment". Technological Forecasting and Social Change. 100: 21–28. doi:10.1016/j.techfore.2015.02.007. ISSN 0040-1625. ^ York, Jonathan L.; Danes, Jeffrey E. (2014-05-22). "Customer Development, Innovation, and Decision-Making Biases int he Lean Startup". Journal of Small Business Strategy. 24 (2): 21–40. ISSN 2380-1751. ^ Teece, David J. (2010). "Business Models, Business Strategy and Innovation". Long Range Planning. 43 (2–3): 172–194. doi:10.1016/j.lrp.2009.07.003. ^ Kask, Johan; Linton, Gabriel (2013). "Business mating: When start ups get it right". Journal of Small Business & Entrepreneurship. 26 (5): 511. doi:10.1080/08276331.2013.876765. ^ a b Hasche, Nina; Linton, Gabriel (December 2017). "The value of failed relationships for the development of a Medtech start up". Journal of Small Business & Entrepreneurship. 30 (1): 97–119. doi:10.1080/08276331.2017.1388953. ISSN 0827-6331. ^ Castrogiovanni, Gary J. (1996-12-01). "Pre-Startup Planning and the Survival of New Small Businesses: Theoretical Linkages". Journal of Management. 22 (6): 801–822. doi:10.1177/014920639602200601. ISSN 0149-2063. ^ "An interview with investor Paul Graham of Y Combinator". TechCrunch. Retrieved 2018-10-01. ^ Lora Kolodny (April 30, 2013). "The Other Credit Crisis: Naming Co-Founders". Wall Street Journal. Retrieved July 1, 2014. ^ Katie Fehrenbacher (June 14, 2009). "Tesla Lawsuit: The Incredible Importance of Being a Founder". Giga Om. Retrieved July 1, 2014. ^ Stevenson, Regan M.; Ciuchta, Michael P.; Letwin, Chaim; Dinger, Jenni M.; Vancouver, Jeffrey B. (2018-06-21). "Out of control or right on the money? Funder self-efficacy and crowd bias in equity crowdfunding". Journal of Business Venturing. 34 (2): 348–367. doi:10.1016/j.jbusvent.2018.05.006. ISSN 0883-9026. ^ a b Uy, Marilyn A.; Foo, Maw-Der; Song, Zhaoli (2013-09-01). "Joint effects of prior start up experience and coping strategies on entrepreneurs' psychological well-being". Journal of Business Venturing. 28 (5): 583–597. doi:10.1016/j.jbusvent.2012.04.003. ISSN 0883-9026. ^ Douglas McGregor. Theory X Theory Y employee motivation theory. Accel-team.com. Retrieved on 2013-07-21. ^ "Zirtual Crashed But Can Its Brand Still Fly?". Forbes. Retrieved 2015-10-16. ^ Alexandros Kakouris Proceedings of the 4th European Conference on Innovation 2010 p95 "In other words, failed entrepreneurs will set up a new business with more and better know-how. Especially if they choose to restart in the same sector with more or less the same activities, there is a big chance that the restarter becomes the better entrepreneur (Schror, 2006). Restarters in this study are defined as entrepreneurs, whose company went bankrupt, but who, after some time, have the courage to start a new company (i.e. 'pure' restarters)." ^ Adam Jolly The European Business Handbook 2003 0749439750 2003 p5 "Our interviews with entrepreneurial restarters underscore the fact that failure is still severely stigmatised in Europe. In marked contrast to the United States, there is no general public perception in Europe that failure is a necessary precondition for success." ^ Chanin, R., Sales, A., Pompermaier, L., and Prikladnicki, R. (2018). Startup software development education: a systematic mapping study. In proceedings of the 40th International Conference on Software Engineering (ICSE ’18), pp. 143-144. ^ a b Campos, Francisco; Frese, Michael; Goldstein, Markus; Iacovone, Leonardo; Johnson, Hillary C.; McKenzie, David; Mensmann, Mona (2017-09-22). "Teaching personal initiative beats traditional training in boosting small business in West Africa". Science. 357 (6357): 1287–1290. doi:10.1126/science.aan5329. ISSN 0036-8075. PMID 28935805. ^ Rauch, Andreas; Hulsink, Willem (June 2015). "Putting Entrepreneurship Education Where the Intention to Act Lies: An Investigation Into the Impact of Entrepreneurship Education on Entrepreneurial Behavior". Academy of Management Learning & Education. 14 (2): 187–204. doi:10.5465/amle.2012.0293. ISSN 1537-260X. ^ Paternoster, N., Giardino, C., Unterkalmsteiner, M., Gorschek, T., Abrahamsson, P. (2014). Software Development in Startup Companies: A Systematic Mapping Study. Information and Software Technology 56(10), 1200–1218. ^ Blank, S.: The Four Steps to the Epiphany: Successful Strategies for Products That Win. K&S Ranch, Incorporated (2013). ^ Buffardi, K., Robb, C., Rahn, D. (2017) Tech startups: realistic software engineering projects with interdisciplinary collaboration. Journal of Computing Sciences in Colleges 32(4), 93–98. ^ A Legal Bridge Spanning 100 Years: From the Gold Mines of El Dorado to the 'Golden' Startups of Silicon Valley by Gregory Gromov 2010. ^ "NY Tech Alliance". nytm.org. ^ Majewski, Taylor. " NYC tech's 35 people to watch in 2016", builtinnyc, New York, 26 May 2016. Retrieved on 01 June 2016. ^ JAMES F. MCDONOUGH III (2007). "The Myth of the Patent Troll: An Alternative View of the Function of Patent Dealers in an Idea Economy". Emory Law Journal. http://papers.ssrn.com/sol3/papers.cfm?abstract_id=959945. Retrieved 2007-07-27. ^ "Startups, VCs Now Free To Advertise Their Fundraising Status". The Wall Street Journal. 2013-09-23. Retrieved September 23, 2013. ^ "All-comers join web party for a punt on best start ups". Financial Times. Retrieved September 26, 2013. ^ "The ban has lifted: Here's what these 6 companies think about general solicitation". Venturebeat. 2013-09-23. Retrieved September 23, 2013. ^ "Investor.gov". Securities and Exchange Commission. Retrieved July 1, 2014. ^ Amit Ghosh (14 December 2014). "How To Choose The Best Business Structure To Choose For A Start up?". The Startup Journal. Retrieved 30 April 2016. ^ Bill Gross. "Bill Gross: The single biggest reason why startups succeed - TED Talk - TED.com". ^ Goodman, Michelle. "4 Tips for Landing Revenue-Based Financing". Entrepreneur. Retrieved 8 February 2019. ^ Prentice, Claire (2010-05-12). "Cash-strapped entrepreneurs get creative". BBC News. ^ "Revisiting the myths about entrepreneurship and innovation - Vivek Wadhwa". Vivek Wadhwa. 30 August 2018. Retrieved 2018-10-06. ^ "With the new JOBS Act a new era of investment banking?". Nasdaq. Retrieved September 24, 2013. ^ "Jumpstart Our Business Startups (JOBS) Act Spotlight". SEC.GOV. Retrieved July 1, 2014. ^ "Newly Legal: Buying Stock in Start Ups Via Crowdsourcing". ABC News. 2013-09-24. Retrieved September 24, 2013. ^ "Levine on Wall Street: Chrysler's Unwanted IPO". Bloomberg. Retrieved September 24, 2013. ^ "Global Crowdfunding Market to Reach $34.4B in 2015, Predicts Massolution's 2015CF Industry Report". www.crowdsourcing.org. ^ "Grow VC launches, aiming to become the Kiva for tech startups". TechCrunch. AOL. 15 February 2010. ^ "Crowdsourced Fundraising Platform ProFounder Now Offers Equity-Based Investment Tools". TechCrunch. AOL. 3 May 2011. ^ "Fundraising Platform For Startups ProFounder Shuts Its Doors". TechCrunch. AOL. 17 February 2012. ^ "General Solicitation Ban Lifted Today - Three Things You Must Know About It". Forbes. Retrieved September 23, 2013. ^ "For broker/dealers, crowdfunding presents new opportunity". Washington Post. Retrieved March 28, 2013. ^ Chen, Jianhong; Nadkarni, Sucheta (2017-03-01). "It's about Time! CEOs' Temporal Dispositions, Temporal Leadership, and Corporate Entrepreneurship". Administrative Science Quarterly. 62 (1): 31–66. doi:10.1177/0001839216663504. ISSN 0001-8392. ^ "Hong Kong in Honduras", The Economist, December 10, 2011. ^ Barking mad: Can office dogs reduce stress? - CNN.com. Edition.cnn.com. Retrieved on 2013-07-21.